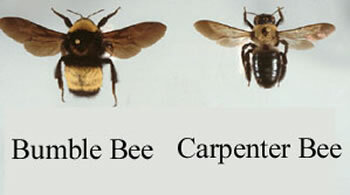 Key difference: The easiest way to differentiate between carpenter bees and bumblebees is from their abdomens. Carpenter bees have a bare and shiny black abdomen, whereas bumblebees have a hairy abdomen that will usually have some type of yellow marking on them. Carpenter Bees and Bumblebees are two common types of bees. They look quite similar to each other which is why it is often difficult to tell them apart. While there are many factors that differentiate the two types of bees, there is one easiest way to tell them apart. This is a visual cue that allows one to tell them apart in one glance. This visual clue is their abdomen. Carpenter bees have a bare and shiny black abdomen, whereas bumblebees have a hairy abdomen that will usually have some type of yellow marking on them. Additionally, the males of some species of carpenter bees have a white or yellow face, unlike bumblebees. Another difference is that the females lack the bare corbicula, i.e. pollen basket of bumblebees; the hind leg of carpenter bees is entirely hairy. Bumble bees are much more common than carpenter bees. They are present in most parts of the world and there are about 250 different species of bumblebees. Whereas, carpenter bees are not that widespread and have only a few species. Some other differences between them include the way they nest. Carpenter bees nest in pairs with one male and one female. When ready, the female will drill a hole into wood and lay her eggs within tunnels carved in the wood. This is also where the common name, carpenter bees comes from. Bumblebees, on the other hand, tend to live in a colony with a queen bee, and the rest as working bees. This colony can be between the sizes of 50 to upwards of a 100. Unlike popular believe, bumblebees do not make hives or nests on trees, but rather tend to nest in the ground. A hairy abdomen with at least some yellow markings. Each bee will drill its own nest and reside alone. Bumblebees tend to live in colonies of a few hundred individuals with a single queen. The female will bores holes in wood and lays eggs in it. The males will hover around and aggressively scare off visitors. Bumblebees usually tend to nest in the ground. Males do not have stingers. Females have stingers but do not sting until greatly provoked. Queen and worker bumblebees can sting repeatedly, but generally ignore humans and other animals. Do not have the corbicula, i.e. pollen basket. Females tend to have a corbicula, i.e. pollen basket on their hind leg.